"Be Our Guest" at our Orlando Vacation Home Rentals (Villas Mickey & Minnie). Only 3.5 miles to Disneyworld. Most importantly, our villas are located on the Premier gated community in the Disney area known as the Windsor Palms Resort (Only 3.5 miles to Disney). The WP Resort has been recommended by the BBC's "Holiday-You Call the Shots". Most recently the Times Online (UK) mentioned the WP Resort as one of Americas Best Vacation Home Communities. 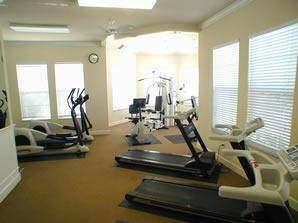 Set in a peaceful and tranquil location yet only 3.5 miles from Disney, with every possible resort style amenity at your disposal. *Shuttle service to the attractions (small charge for shuttle service). Short walk to the Mystic Dunes Golf Course. Chapman: Cowes, Isle of Wright, UK: Just to let you know that we had a really fabulous time! Your home at Fan Palm is absolutely wonderful, it was home from home for us but with lovely sunny weather! and a pool! I am going to be writing an article for a National Newspaper in England regarding our holiday as we went to Miami and The Everglades for a couple of days as well and swam with the Dolphins which was out of this world! Would you mind me including details of your home as, believe me, it is highly worthy of it! 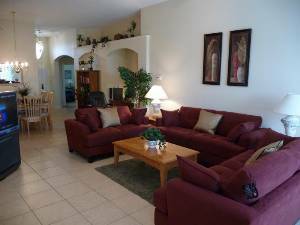 We would love to have you and your family as guests in our lovely Orlando Vacation Rental Homes (Villas "Mickey" & "Minnie") at fabulous Windsor Palms Resort, and we look forward to hearing from you. 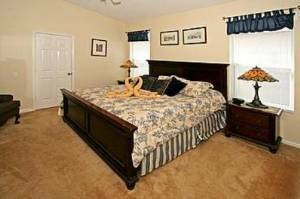 All of the "Magic" of Orlando is within close proximity to our villas. Heated and screened pool, luxurious spa, and a Fireworks View of Disneyworld every night. 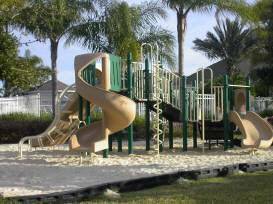 Guests have Full use of ALL amenities at the gated Windsor Palms Resort. I've been meaning to write to tell you that your villa was absolutely amazing! I've stayed in rental homes/townhouses before that seemed like cheap apartments. So we were very pleasantly surprised to walk into your wonderful home, with beautiful furniture and decor, lovely placesettings on the tables, even the dishtowel folded like a swan. It was like a 5 star resort. :) It was great to be able to stay together with our friends' family, too, and there was plenty of room for all of us. 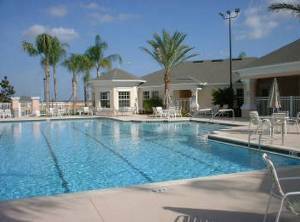 The kids loved the heated pool on the cool evenings and it was also convenient to DisneyWorld. You, your management company, and cleaning crew do a great job at providing very comfortable accommodations at a reasonable cost. We will definitely contact you in the future if we ever travel to the Orlando area again and would be happy to provide a recommendation to any potential guests. Just got home and wanted to say mickey's house was outstanding. We have rented condo's and even owned a time share in orlando, But the mickey's house has changed our mind how to go from now on. We came down for a wedding and spend New Year's at Disney. The house made the whole trip worth while. Just a quick comment about the villa Mickey. Home and community were both great. The house was clean and had all the essentials needed tio make us feel at home. The location was also perfect. There was only two of us but we have no complaints what so ever. Thanks so much for the great place to stay on our first trip to Disney. We hoep to be welcomed back in the future and would recommend the great house and your great service to all. Thanks again. 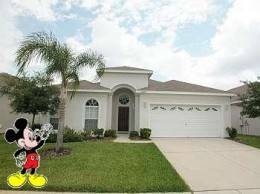 We had a fabulous holiday in Florida July 2005 and stayed in Villa Mickey. We were delighted with everything and the villa was a home from home. All that we needed was there in the villa. We will definately be in touch as we are planning our next trip in 2007 and would be more than happy to base ourselves at Windsor Palms again. I just wanted to let you know how much we loved our experience staying at your rental property. Everything about your home was wonderful, the furnishings, the decor, the location, the pool and hot tub and of course the resort itself. Everything was of the highest standards and it was very comfortable and lacked nothing that I could think of. We stayed for one week and our only regret was having to go back home. 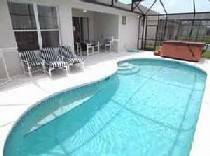 I wish we had booked two weeks instead of the one, but we will have to wait until our next vacation and you can be assured that on our next trip to Florida, we will certainly be looking to rent your property again. We had a great time and would definately recommend your property to anyone interested in staying in the Orlando area. Thanks very much for helping to make our vacation a GREAT success. Just to let you know that we had a really fabulous time! Your home at Fan Palm is absolutely wonderful, it was home from home for us but with lovely sunny weather! and a pool! I am going to be writing an article for a National Newspaper in England regarding our holiday as we went to Miami and The Everglades for a couple of days as well and swam with the Dolphins which was out of this world! Would you mind me including details of your home as, believe me, it is highly worthy of it! decorated, well maintained and furnished with everything we would ever need during our stay. It was as if we had never left our homes. 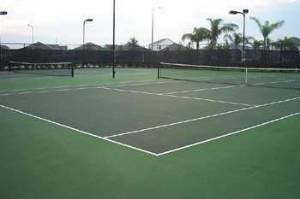 Your villa is very ideally located and the community club house was a great place for recreation and entertainment. Therefore, it is our decision to rent from you again whenever we decide to go back to Florida. And we will definitely recommend your place to our friends and family. We've all had a great time during our stay. Thank you again from everyone in our group. We have just returned from our Florida trip. I just wanted to drop you a note to let you know what a fabulous time we had during our stay in your villa. The villa is absolutely beautiful, and you truly have thought of everything! We felt very much at home there and the location was wonderful as well. What a way to vacation! I'll never want to stay in a regular hotel again! Thanks again. It was a pleasure dealing with you and I would highly recommend you and your villa to anyone! Just wanted to write and say thank you so much for allowing us the opportunity to use your villa. I did not expect that it would exceed my expectations. Having organised the holiday for so many people I was so nervous that it wouldn't work out but I think anything could have gone wrong once we got inside that villa. We were set for two weeks then, whatever happened. I really don't think there is anything I can say to you that needs improving, we had everything we needed and more and everything was top notch. My husband and I spent a week of our honeymoon in Florida which is why we wanted to take our families back because we loved it so much. We were in a hotel though for that period and little did we think that the holiday could be improved so much by the accommodation. We will now only ever go to a villa and that is down to you and the standard that you have shown us. Just wanted to send a note to thank you for the use of your home during our Florida vacation. Everything was exactly like your website stated. You have a lovely home. My children especially loved the pool. As a matter of fact, the pool was probably their favourite part of the whole trip. Anyway, I will highly recommend you and your home to anyone who asks. Thank you once again. We are really enjoying our holiday in Florida and think your villa is lovely. We really like the hot tub and the children love having their own bathrooms. We have flights booked for 2004 already and wondered if you had those dates available for us for next year if so we would like to book with you again. Your home is absolutely wonderful! It is more than we could have ever expected. All the ‘little’ extra touches like the music and DVDs and internet access really make it feel just like home. The furniture is exquisite. The bed linens, Thomas Kinkade art and all the other décor make it so beautiful. You certainly can’t get this quality in a hotel room. We keep pinching ourselves to make sure this is all real! The spa is just what we need to relax our tired muscles after a long day. Thanks again for your hospitality. This vacation has been a dream come true! Usually around day 4 of our vacations I can't wait to get back home to my own home and bed. This has been the first vacation that I was actually disappointed to have to leave. The accommodations were so comfortable that I could have stayed another week! All of us in our party talked about when we could all come back. Please be assured that within the next few years I will be contacting you again to rent one of your homes in Windsor Palms! All rates Add 13% Florida tax. Pool heat $20/day+tax, if requested. Full payment due 8 weeks prior to arrival. Our management company will gladly accept credit cards and Paypal for the standard 4% surcharge. Less than 7 night stay ($99 cleaning fee) Rates subject to change until booked. See webpage for any special rates available. Deposit: $350 Booking deposit. $350 security deposit. Less than 7 night stay $99 cleaning fee. Cancellations and Refunds: Any cancellation loss of booking deposit. See webpage for additional terms & conditions.